Kimberly Foxx, the first African-American woman to serve as Cook County state's attorney in Chicago, found herself under fire Tuesday after her office stunned the country by suddenly dropping all charges against "Empire" actor Jussie Smollett. The state's attorney's office announced its decision to drop the charges just weeks after he was indicted on 16 felony counts of filing a false police reportin connection with his claim to be the victim of a hate crime in January. Foxx had recused herself from the racially-charged case last month, before Smollett was charged, and handed it over to her deputy, with a representative of her office saying at the time the recusal "was made to address potential questions of impartiality based upon familiarity with potential witnesses in the case." It was later reported by the Chicago Sun-Times that Tina Tchen, a Chicago lawyer and former chief of staff to first lady Michelle Obama, had put Foxx in touch with members of Jussie Smollet's family days after he told police he was the victim of a homophobic, racist attack. A Chicago police union, the Fraternal Order of Police, has now asked the Department of Justice to investigate Foxx's role in the decision to not prosecute Smollett. "The FOP is outraged by the decision to drop charges against Smollett, but not surprised," the union said in an emailed statement to NBC News. "Since Kimberly Foxx has taken office, she has transformed the prosecutor's office to a political arm of the anti-police movement. We renew our call for a federal investigation of her role in this case and expect the media to conduct a thorough investigation." There was no direct response from Foxx. Her spokeswoman, Tandra Simonton, insisted that the Smollett case was treated no differently from the more than 5,700 other "cases for alternative prosecution" that the office has handled in the past two years. "This is not a new or unusual practice," Simonton said in a statement. According to the statement, it does not mean prosecutors had any problem with the Chicago Police Department's investigation of Smollett, who told police on Jan. 29 that he had been beaten up by two masked men in the swanky Streeterville neighborhood while he was out getting food. The actor, who is gay and black, claimed his attackers hurled racist and homophobic slurs before punching him, putting a noose around his neck, and dousing him with what he said was bleach. 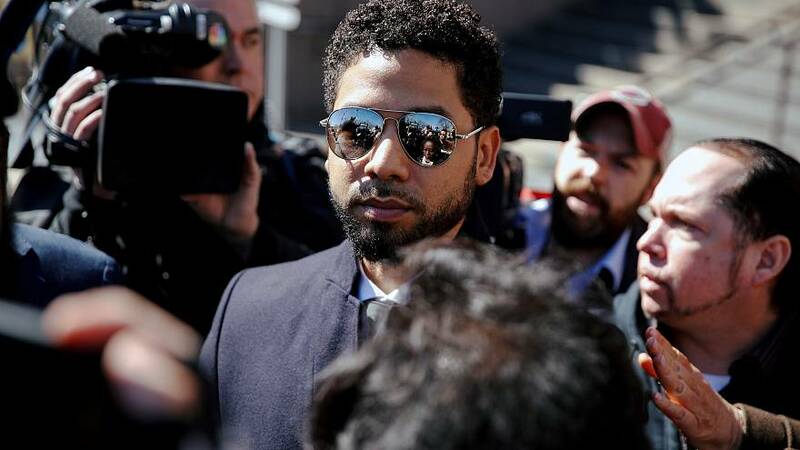 "We did not exonerate Mr. Smollett," Simonton said. "The charges were dropped in return for Mr. Smollett's agreement to do community service and forfeit his $10,000 bond to the City of Chicago. Without the completion of these terms, the charges would not have been dropped. This outcome was met under the same criteria that would occur for and is available to any defendant with similar circumstances." Simonton's statement came after Chicago Mayor Rahm Emanuel denounced the Smollett decision as a "whitewash of justice" and Chicago Police Supt. Eddie Johnson said his department was blindsided by the move. "That's completely false, this is not a whitewash of justice," Joe Magats, the first assistant state's attorney, told WMAQ radio. The deal Smollett got "is available to all defendants; it's not something out of privilege; it's not something out of clout," Magats said. Suspicions that Smollett might be getting a special deal were raised earlier this month when Chicago news outlets reported that Foxx had tried to persuade Johnson to turn the case over to the FBI. Foxx made the call to Johnson after Tchen put her in touch with members of Smollett's family, who said "they have concerns about the investigation." NBC News reached out to Tchen for comment but did not immediately hear back. This was before police began to suspect that Smollett had made the whole episode up. "They had no doubt about the quality of the investigation, but believed that the FBI would have a tighter lid on the information," Foxx told the Chicago Sun-Times, insisting that Johnson seemed receptive to the idea of turning the case over to the FBI. Foxx, 46, who was born in Chicago and raised in the notorious now-demolished Cabrini-Green housing projects, is a married mother of two daughters. She earned both her undergraduate and law degrees from Southern Illinois University. Prior to her election as Chicago's top prosecutor, Foxx was an an assistant state's attorney for 12 years. She then served as chief of staff for Cook County Board President Toni Preckwinkle, who is now battling fellow Democrat Lori Lightfoot for the chance to become Chicago's first African-American female mayor. On her official web page, Foxx said that since taking office in December 2016 she has, among other things, "revamped the office's Conviction Integrity Unit, resulting in overturned convictions in over 60 cases, including the first-ever mass exoneration in Cook County for 15 men whose convictions stemmed from misconduct by a Chicago Police Officer."